My raspberry pi is connected via Ethernet to my Ubuntu 14.04 machine (192.168.1.0/24 on eth0). This machine is connected to the Internet through a Fritz Box WLAN Router (192.168.0.0/24 on wlan0). To have internet access on my raspberry, I've successfully enabled IP forwarding (net.ipv4.ip_forward) on the Ubuntu machine and configured it's eth0 IP 192.168.1.1 as default gateway on the raspberry. On the Fritz Box I registered the subnet by adding a static IP route to 192.168.1.0/24 through the gateway 192.168.0.2 (see http://en.avm.de/nc/service/fritzbox/fritzbox-7390/knowledge-base/publication/show/581_Configuring-a-static-IP-route-in-the-FRITZ-Box/). The Fritz Box runs a DHCP server, but it's configured to give always the same IP to my Ubuntu server. From the Ubuntu machine and the raspberry I'm able to ping and access everything (Internet, Laptop, Fritz Box). But from the laptop and other devices in the WLAN I'm not able to access the raspberry. So it actually goes the right way, but it stucks on the Ubuntu machine. I've already tried configuring NAT rules, but in my opinion they shouldn't be necessary since the iptables are configured to allow everything (a blocking firewall runs already on the Fritz box) and IP forwarding is enabled. I even tried enabling proxy_arp on both interfaces without success. Furthermore I found the tool parprouted for bridging wlan0 and eth0, but running it gave me invalid ARP responses (two MAC addresses for the raspberry IP address) - traced with Wireshark. 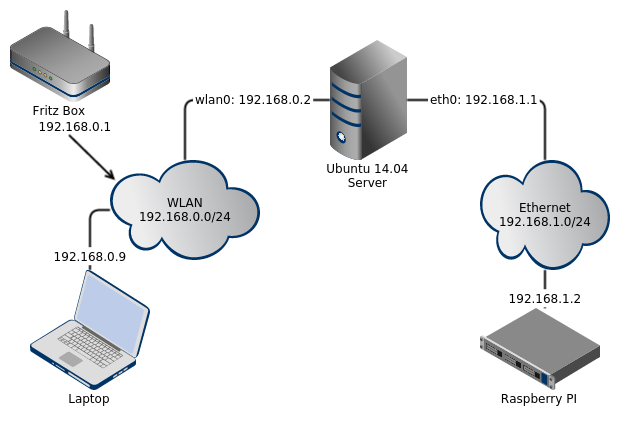 Why can't I access my raspberry from the WLAN network? Have you already solved your problem?? This should set up port-forwarding on your box, though you may just have to use iptables. Not the answer you're looking for? Browse other questions tagged networking server router routing or ask your own question. My server does not forward packets between interfaces. What am I missing?